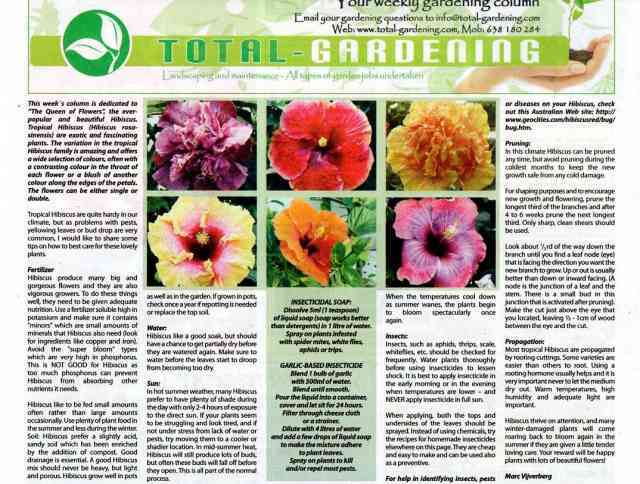 This week�s column is dedicated to �The Queen of Flowers�, the everpopular and beautiful Hibiscus. 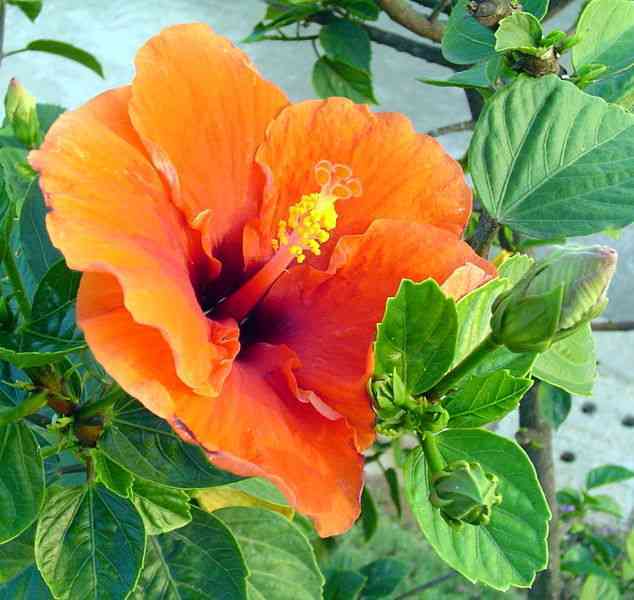 Tropical Hibiscus (Hibiscus rosasinensis) are exotic and fascinating plants. 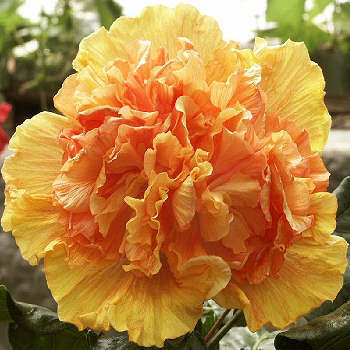 The variation in the tropical Hibiscus family is amazing and offers a wide selection of colours, often with a contrasting colour in the throat of each flower or a blush of another colour along the edges of the petals. The flowers can be either single or double. Tropical Hibiscus are quite hardy in our climate, but as problems with pests, yellowing leaves or bud drop are very common, I would like to share some tips on how to best care for these lovely plants. 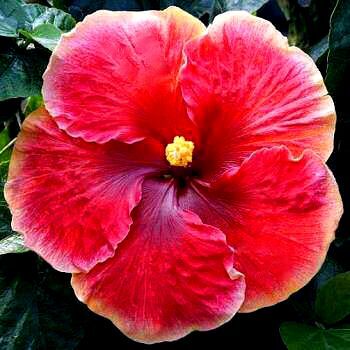 Hibiscus produce many big and gorgeous flowers and they are also vigorous growers. To do these things well, they need to be given adequate nutrition. Use a fertilizer soluble high in potassium and make sure it contains "minors" which are small amounts of minerals that Hibiscus also need (look for ingredients like copper and iron). Avoid the "super bloom" types which are very high in phosphorus. 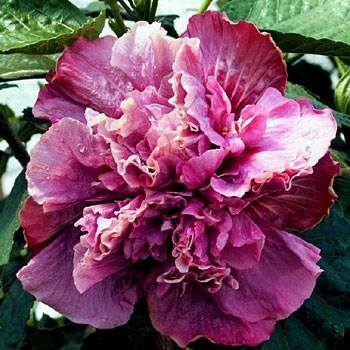 This is NOT GOOD for Hibiscus as too much phosphorus can prevent Hibiscus from absorbing other nutrients it needs. Hibiscus like to be fed small amounts often rather than large amounts occasionally. Use plenty of plant food in the summer and less during the winter. 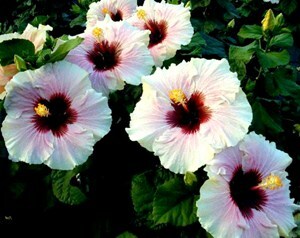 Soil: Hibiscus prefer a slightly acid, sandy soil which has been enriched by the addition of compost. Good drainage is essential. A good Hibiscus mix should never be heavy, but light and porous. Hibiscus grow well in pots as well as in the garden. If grown in pots, check once a year if repotting is needed or replace the top soil. Hibiscus like a good soak, but should have a chance to get partially dry before they are watered again. Make sure to water before the leaves start to droop from becoming too dry. In hot summer weather, many Hibiscus prefer to have plenty of shade during the day with only 2-4 hours of exposure to the direct sun. If your plants seem to be struggling and look tired, and if not under stress from lack of water or pests, try moving them to a cooler or shadier location. In mid-summer heat, Hibiscus will still produce lots of buds, but often these buds will fall off before they open. When the temperatures cool down as summer wanes, the plants begin to bloom spectacularly once again. Insects, such as aphids, thrips, scale, whiteflies, etc. should be checked for frequently. Water plants thoroughly before using insecticides to lessen shock. It is best to apply insecticide in the early morning or in the evening when temperatures are lower � and NEVER apply insecticide in full sun. When applying, both the tops and undersides of the leaves should be sprayed. Instead of using chemicals, try the recipes for homemade insecticides elsewhere on this page. They are cheap and easy to make and can be used also as a preventive. In this climate Hibiscus can be pruned any time, but avoid pruning during the coldest months to keep the new growth safe from any cold damage. For shaping purposes and to encourage new growth and flowering, prune the longest third of the branches and after 4 to 6 weeks prune the next longest third. Only sharp, clean shears should be used. Look about 1/3rd of the way down the branch until you find a leaf node (eye) that is facing the direction you want the new branch to grow. Up or out is usually better than down or inward facing. (A node is the junction of a leaf and the stem. There is a small bud in this junction that is activated after pruning). Make the cut just above the eye that you located, leaving � - 1cm of wood between the eye and the cut. Most tropical Hibiscus are propagated by rooting cuttings. Some varieties are easier than others to root. Using a rooting hormone usually helps and it is very important never to let the medium dry out. Warm temperatures, high humidity and adequate light are important. Hibiscus thrive on attention, and many winter-damaged plants will come roaring back to bloom again in the summer if they are given a little tender loving care. Your reward will be happy plants with lots of beautiful flowers!